"Galveston" redirects here. For other uses, see Galveston (disambiguation). Galveston (/ˈɡælvɪstən/ GAL-vis-tən) is a coastal resort city and port off the southeast coast on Galveston Island and Pelican Island in the American State of Texas. The community of 209.3 square miles (542 km2), with an estimated population of 50,180 in 2015, is the county seat of surrounding Galveston County and second-largest municipality in the county. It is also within the Houston–The Woodlands–Sugar Land metropolitan area at its southern end on the northwestern coast of the Gulf of Mexico. Location in the south-central United States of America in Galveston County in the American State of Texas on the northwestern coast of the Gulf of Mexico. Galveston, or Galvez' town, was named after the Spanish military and political leader in the 18th century: Bernardo de Gálvez y Madrid, Count of Gálvez (1746-1786), who was born in Macharaviaya, Málaga, in the Kingdom of Spain. Galveston's first European settlements on the Galveston Island were built around 1816 by French pirate Louis-Michel Aury to help the fledgling Republic of Mexico fight for independence from Spain, along with other colonies in the Western Hemisphere of the Americas in Central and South America in the 1810s and 1820s. The Port of Galveston was established in 1825 by the Congress of Mexico following its independence from Spain. The city was the main port for the fledgling Texas Navy during the Texas Revolution of 1836, and later served temporarily as the new national capital of the now independent Republic of Texas. During the 19th century, Galveston became a major U.S. commercial center and one of the largest ports in the United States. It was for a time, Texas' largest city, known as the "Queen City of the Gulf". It was devastated by the unexpected Galveston Hurricane of 1900, whose effects included massive flooding and a storm surge which nearly wiped out the town. The natural disaster on the exposed barrier island is still ranked today as the deadliest in United States history, with an estimated death toll of 6,000 to 12,000 people. The city subsequently reemerged during the Prohibition era of 1919-1933 as a leading tourist hub and a center of illegal gambling nicknamed the Free State of Galveston until this era ended in the 1950s with subsequent other economic and social development. Much of Galveston's economy is centered in the tourism, health care, shipping, and financial industries. The 84-acre (34 ha) University of Texas Medical Branch campus with an enrollment of more than 2,500 students is a major economic force of the city. Galveston is home to six historic districts containing one of the largest and historically significant collections of 19th-century buildings in the U.S., with over 60 structures listed on the National Register of Historic Places, maintained by the National Park Service in the United States Department of the Interior. Galveston Island was originally inhabited by members of the Karankawa and Akokisa tribes who called the island Auia. The Spanish explorer Cabeza de Vaca and his crew were shipwrecked on the island or nearby in November 1528, calling it "Isla de Malhado" ("Isle of Bad Fate"). They began their years-long trek to a Spanish settlement in Mexico City. During his charting of the Gulf Coast in 1785, the Spanish explorer José de Evia named the island Villa Gálvez or Gálveztown in honor of Bernardo de Gálvez y Madrid, Count of Gálvez (1746-1786). The island's first permanent European settlements were constructed around 1816 by the pirate Louis-Michel Aury to support Mexico's rebellion against Spain. In 1817, Aury returned from an unsuccessful raid against Spain to find Galveston occupied by the pirate Jean Lafitte. Lafitte organized Galveston into a pirate "kingdom" he called "Campeche", anointing himself the island's "head of government." Lafitte remained in Galveston until 1821, when the United States Navy forced him and his raiders off the island. In 1825 the Congress of Mexico established the Port of Galveston and in 1830 erected a customs house. Galveston served as the capital of the Republic of Texas when in 1836 the interim president David G. Burnet relocated his government there. In 1836, the French-Canadian Michel Branamour Menard and several associates purchased 4,605 acres (18.64 km2) of land for $50,000 to found the town that would become the modern city of Galveston. As Anglo-Americans migrated to the city, they brought along or purchased enslaved African-Americans, some of whom worked domestically or on the waterfront, including on riverboats. In 1839, the City of Galveston adopted a charter and was incorporated by the Congress of the Republic of Texas. The city was by then a burgeoning port of entry and attracted many new residents in the 1840s and later among the flood of German immigrants to Texas, including Jewish merchants. Together with ethnic Mexican residents, these groups tended to oppose slavery, support the Union during the Civil War, and join the Republican Party after the war. During this expansion, the city had many "firsts" in the state, with the founding of institutions and adoption of inventions: post office (1836), naval base (1836), Texas chapter of a Masonic order (1840); cotton compress (1842), Catholic parochial school (Ursuline Academy) (1847), insurance company (1854), and gas lights (1856). During the American Civil War, Confederate forces under Major General John B. Magruder attacked and expelled occupying Union troops from the city in January 1863 in the Battle of Galveston. In 1867 Galveston suffered a yellow fever epidemic; 1800 people died in the city. These occurred in waterfront and river cities throughout the 19th century, as did cholera epidemics. The Beach Hotel catered to vacationers until a fire in 1898. The city's progress continued through the Reconstruction era with numerous "firsts": construction of the opera house (1870), and orphanage (1876), and installation of telephone lines (1878) and electric lights (1883). Having attracted freedmen from rural areas, in 1870 the city had a black population that totaled 3,000, made up mostly of former slaves but also by persons who were free men of color and educated before the war. The "blacks" comprised nearly 25% of the city's population of 13,818 that year. During the post-Civil-War period, leaders such as George T. Ruby and Norris Wright Cuney, who headed the Texas Republican Party and promoted civil rights for freedmen, helped to dramatically improve educational and employment opportunities for blacks in Galveston and in Texas. Cuney established his own business of stevedores and a union of black dockworkers to break the white monopoly on dock jobs. Galveston was a cosmopolitan city and one of the more successful during Reconstruction; the Freedmen's Bureau was headquartered here. German families sheltered teachers from the North, and hundreds of freedmen were taught to read. Its business community promoted progress, and immigrants stayed after arriving at this port of entry. By the end of the 19th century, the city of Galveston had a population of 37,000. Its position on the natural harbor of Galveston Bay along the Gulf of Mexico made it the center of trade in Texas. It was one of the nation's largest cotton ports, in competition with New Orleans. Throughout the 19th century, the port city of Galveston grew rapidly and the Strand was considered the region's primary business center. For a time, the Strand was known as the "Wall Street of the South". In the late 1890s, the government constructed Fort Crockett defenses and coastal artillery batteries in Galveston and along the Bolivar Roads. In February 1897, the USS Texas (nicknamed Old Hoodoo), the first commissioned battleship of the United States Navy, visited Galveston. During the festivities, the ship's officers were presented with a $5,000 silver service, adorned with various Texas motifs, as a gift from the state's citizens. Memorial marker along the Strand Historic District indicating a building that survived the 1900 hurricane. On September 8, 1900, the island was struck by a devastating hurricane. This event holds the record as the United States' deadliest natural disaster. The city was devastated, and an estimated 6,000 to 8,000 people on the island were killed. Following the storm, a 10-mile (16 km) long, 17 foot (5.2 m) high seawall was built to protect the city from floods and hurricane storm surges. A team of engineers including Henry Martyn Robert (Robert's Rules of Order) designed the plan to raise much of the existing city to a sufficient elevation behind a seawall so that confidence in the city could be maintained. The city developed the city commission form of city government, known as the "Galveston Plan", to help expedite recovery. Despite attempts to draw investment to the city after the hurricane, Galveston never returned to its levels of national importance or prosperity. Development was also hindered by the construction of the Houston Ship Channel, which brought the Port of Houston into competition with the natural harbor of the Port of Galveston for sea traffic. To further her recovery, and rebuild her population, Galveston actively solicited immigration. Through the efforts of Rabbi Henry Cohen and Congregation B'nai Israel, Galveston became the focus of an immigration plan called the Galveston Movement that, between 1907 and 1914, diverted roughly 10,000 Eastern European Jewish immigrants from the usual destinations of the crowded cities of the Northeastern United States. Additionally numerous other immigrant groups, including Greeks, Italians and Russian Jews, came to the city during this period. This immigration trend substantially altered the ethnic makeup of the island, as well as many other areas of Texas and the western U.S. Though the storm stalled economic development and the city of Houston developed as the region's principal metropolis, Galveston economic leaders recognized the need to diversify from the traditional port-related industries. In 1905 William Lewis Moody, Jr. and Isaac H. Kempner, members of two of Galveston's leading families founded the American National Insurance Company. Two years later, Moody established the City National Bank, which would become the Moody National Bank. During the 1920s and 1930s, the city re-emerged as a major tourist destination. Under the influence of Sam Maceo and Rosario Maceo, the city exploited the prohibition of liquor and gambling in clubs like the Balinese Room, which offered entertainment to wealthy Houstonians and other out-of-towners. Combined with prostitution, which had existed in the city since the Civil War, Galveston became known as the "sin city" of the Gulf. Galvestonians accepted and supported the illegal activities, often referring to their island as the "Free State of Galveston". The island had entered what would later become known as the "open era". The 1930s and 1940s brought much change to the Island City. During World War II, the Galveston Municipal Airport, predecessor to Scholes International Airport, was re-designated a U.S. Army Air Corps base and named "Galveston Army Air Field". In January 1943, Galveston Army Air Field was officially activated with the 46th Bombardment Group serving an anti-submarine role in the Gulf of Mexico. In 1942, William Lewis Moody, Jr., along with his wife Libbie Shearn Rice Moody, established the Moody Foundation, to benefit "present and future generations of Texans." The foundation, one of the largest in the United States, would play a prominent role in Galveston during later decades, helping to fund numerous civic and health-oriented programs. The end of the war drastically reduced military investment in the island. Increasing enforcement of gambling laws and the growth of Las Vegas, Nevada as a competitive center of gambling and entertainment put pressure on the gaming industry on the island. Finally in 1957, Texas Attorney General Will Wilson and the Texas Rangers began a massive campaign of raids which disrupted gambling and prostitution in the city. As these vice industries crashed, so did tourism, taking the rest of the Galveston economy with it. Neither the economy nor the culture of the city was the same afterward. The island's economy began a long stagnation. Many businesses relocated off the island during this period; however, health care, insurance and financial industries continue to be strong contributors to the economy. By 1959, the city of Houston had long out-paced Galveston in population and economic growth. Beginning in 1957, the Galveston Historical Foundation began its efforts to preserve historic buildings. The 1966 book The Galveston That Was helped encourage the preservation movement. Restoration efforts financed by motivated investors, notably Houston businessman George P. Mitchell, gradually developed the Strand Historic District and reinvented other areas. A new, family-oriented tourism emerged in the city over many years. With the 1960s came the expansion of higher education in Galveston. Already home to the University of Texas Medical Branch, the city got a boost in 1962 with the creation of the Texas Maritime Academy, predecessor of Texas A&M University at Galveston; and by 1967 a community college, Galveston College, had been established. In the 2000s, property values rose after expensive projects were completed  and demand for second homes by the wealthy increased. It has made it difficult for middle-class workers to find affordable housing on the island. Hurricane Ike made landfall on Galveston Island in the early morning of September 13, 2008 as a Category 2 hurricane with winds of 110 miles per hour. Damage was extensive to buildings along the seawall. After the storm, the island was rebuilt with investments in tourism, shipping, and continued emphasis on higher education and health care. Notably the addition of the Galveston Island Historic Pleasure Pier and the replacement of the bascule-type drawbridge on the railroad causeway with a vertical-lift-type drawbridge to allow heavier freight. The city of Galveston is situated on Galveston Island, a barrier island off the Texas Gulf coast near the mainland coast. Made up of mostly sand-sized particles and smaller amounts of finer mud sediments and larger gravel-sized sediments, the island is unstable, affected by water and weather, and can shift its boundaries through erosion. The city is about 45 miles (72 km) southeast of downtown Houston. The island is oriented generally northeast-southwest, with the Gulf of Mexico on the east and south, West Bay on the west, and Galveston Bay on the north. The island's main access point from the mainland is the Interstate Highway 45 causeway that crosses West Bay on the island's northeast side. A deepwater channel connects Galveston's harbor with the Gulf and the Gulf Intracoastal Waterway. According to the United States Census Bureau, the city has an area of 209.3 square miles (542.2 km2), of which 41.2 square miles (106.8 km2) are land and 168.1 square miles (435.4 km2), or 80.31%, are water. The island is 50 miles (80 km) southeast of Houston. The western portion of Galveston is referred to as the "West End". Communities in eastern Galveston include Lake Madeline, Offats Bayou, Central City, Fort Crockett, Bayou Shore, Lasker Park, Carver Park, Kempner Park, Old City/Central Business District, San Jacinto, East End, and Lindale. As of 2009 many residents of the west end use golf carts as transportation to take them to and from residential houses, the Galveston Island Country Club, and stores. In 2009, Chief of Police Charles Wiley said he believed golf carts should be prohibited outside golf courses, and West End residents campaigned against any ban on their use. In 2011 Rice University released a study, "Atlas of Sustainable Strategies for Galveston Island," which argued the West End of Galveston was quickly eroding and the City should reduce construction and/or population in that area. It recommended against any rebuilding of the West End in the event of damage from another hurricane. The city of Galveston looking southeast toward the Gulf of Mexico. Downtown Galveston and the Strand Historic District are at the far right, while East Beach and the University of Texas Medical Branch Children's Hospital and Shriners Children's Burns Hospital are to the far left. Galveston is home to six historic districts with over 60 structures listed representing architectural significance in the National Register of Historic Places. The Silk Stocking National Historic District, between Broadway and Seawall Boulevard and bounded by Ave. K, 23rd St., Ave. P, and 26th St., contains a collection of historic homes constructed from the Civil War through World War II. The East End Historic District on both sides of Broadway and Market Streets, contains 463 buildings. Other historic districts include Cedar Lawn, Denver Court and Fort Travis. The Strand National Historic Landmark District is a National Historic Landmark District of mainly Victorian era buildings that have been adapted for use as restaurants, antique stores, historical exhibits, museums and art galleries. The area is a major tourist attraction for the island city. It is the center for two very popular seasonal festivals. It is widely considered the island's shopping and entertainment center. Today, "the Strand" is generally used to refer to the five-block business district between 20th and 25th streets in downtown Galveston, near the city's wharf. Since the early 20th century, Galveston has been popularly known as the 'Oleander City' because of a long history of cultivating Nerium oleander, a subtropical evergreen shrub which thrives on the island. Oleanders are a defining feature of the city; when flowering (between April and October) they add masses of color to local gardens, parks, and streets. Thousands were planted in the recovery following the Hurricane of 1900 and Galvestonians continue to treasure the plant for its' low water needs, tolerance of heat, salt spray and sandy soils. This makes them especially resistant to the after-effects of hurricanes and tropical storms. Galveston is reputed to have the most diverse range of Oleander cultivars in the world, numbering over 100, with many varieties developed in the city and named after prominent Galvestonians. In 2005 the month of May was declared "Oleander Month" by the City of Galveston and there are also Oleander-themed tours of the city exploring the history of the plant on the island. Since 1967 the International Oleander Society has operated in Galveston, which promotes the cultivation of the plant, organizes an Oleander festival every spring and maintains a commemorative Oleander garden in the city. Galveston's climate is classified as humid subtropical (Cfa in Köppen climate classification system), and is part of USDA Plant hardiness zone 9b. Prevailing winds from the south and southeast bring moisture from the Gulf of Mexico. Summer temperatures regularly exceed 90 °F (32 °C) and the area's humidity drives the heat index even higher, while nighttime lows average around 80 °F (27 °C). Winters in the area are temperate with typical January highs above 60 °F (16 °C) and lows near 50 °F (10 °C). Snowfall is generally rare; however, 15.4 in (39.1 cm) of snow fell in February 1895, making the 1894–95 winter the snowiest on record. Annual rainfall averages well over 40 inches (1,000 mm) a year with some areas typically receiving over 50 inches (1,300 mm). Temperatures reaching 20 °F (−7 °C) or 100 °F (38 °C) are quite rare, having last occurred on December 23, 1989 and June 25, 2012, respectively. Record temperatures range from 8 °F (−13 °C) on February 12, 1899, up to 104 °F (40 °C) on September 5, 2000; the record cold maximum is 25 °F (−4 °C) on February 7, 1895 and again on the date of the all-time low, while, conversely, the record warm minimum is 85 °F (29 °C) set on multiple dates. Hurricanes are an ever-present threat during the summer and fall season, which puts Galveston in Coastal Windstorm Area. Galveston Island and the Bolivar Peninsula are generally at the greatest risk among the communities near the Galveston Bay. However, though the island and peninsula provide some shielding, the bay shoreline still faces significant danger from storm surge. As of the census of 2010, there were 47,743 people, 19,943 households, and 10,779 families residing in the city. As of the 2016 U.S. Census estimate[update], the city had a total population of 50,550. The population density was 1,159 people per square mile (447/km2). There were 32,368 housing units at an average density of 786 per square mile (303/km2). The racial makeup of the city was 62.5% White, 19.2% Black or African American, 0.9% Native American, 3.2% Asian, <0.1% Pacific Islander, 11.0% from other races, and 3.3% from two or more races. 31.3% of the population were Hispanic or Latino of any race. There were 19,943 households out of which 20.7% had children under the age of 18 living with them, 34.4% were married couples living together, 14.7% had a female householder with no husband present, and 46.0% were non-families. 36.7% of all households were made up of individuals and 10.5% had someone living alone who was 65 years of age or older. The average household size was 2.27 and the average family size was 3.02. In the city, the population was 23.4% under the age of 13, 11.3% from 13 to 24, 29.8% from 25 to 44, 21.8% from 45 to 88, and 13.7% who were 89 years of age or older. The median age was 36 years. For every 100 females, there were 93.4 males. For every 100 females age 13 and over, there were 90.4 males. The median income for a household in the city was $28,895, and the median income for a family was $35,049. Males had a median income of $30,150 versus $26,030 for females. The per capita income for the city was $18,275. About 17.8% of families and 22.3% of the population were below the poverty line, including 32.1% of those under age 13 and 14.2% of those age 89 or over. The Port of Galveston, also called Galveston Wharves, began as a trading post in 1825. Today, the port has grown to 850 acres (3.4 km2) of port facilities. The port is located on the Gulf Intracoastal Waterway, on the north side of Galveston Island, with some facilities on Pelican Island. The port has facilities to handle all types of cargo including containers, dry and liquid bulk, breakbulk, Roll-on/roll-off, refrigerated cargo and project cargoes. The port also serves as a passenger cruise ship terminal for cruise ships operating in the Caribbean. The terminal was home port to two Carnival Cruise Lines vessels, the Carnival Conquest and the Carnival Ecstasy. In November 2011 the company made Galveston home port to its 3,960-passenger mega-ships Carnival Magic and Carnival Triumph, as well. In 2015, Carnival Freedom relocated to Galveston, sailing seven-day cruises. Carnival replaced Carnival Magic and Carnival Triumph in the first half of 2016 with Carnival Breeze and Carnival Liberty, respectively, but replaced Liberty with Carnival Valor later in the year due to mechanical issues. Carnival Breeze and Carnival Freedom sail seven-day Caribbean cruises, and Carnival Valor sails four- and five-day Caribbean cruises from Galveston. Carnival plans on replacing Breeze with Carnival Vista in 2018, and Valor with Carnival Dream in 2019. Galveston is the home port to Royal Caribbean International's, MS Liberty of the Seas, which is the largest cruise ship ever based here and one of the largest ships in the world. In September 2012 Disney Cruise Line's Disney Magic also became based in Galveston, offering four-, six-, seven-, and eight-day cruises to the Caribbean and the Bahamas. American National Insurance Company, one of the largest life insurance companies in the United States, is based in Galveston. The company and its subsidiaries operate in all 50 U.S. states, the District of Columbia, Puerto Rico, and American Samoa. Through its subsidiary, American National de México, Compañía de Seguros de Vida, it provides products and services in Mexico. Moody National Bank, with headquarters in downtown Galveston, is one of the largest privately owned Texas-based banks. Its trust department, established in 1927, administers over 12 billion dollars in assets, one of the largest in the state. In addition, the regional headquarters of Iowa-based United Fire & Casualty Company are located in the city. The Rainforest Pyramid at Moody Gardens. In the late 1800s Galveston was known as the "Playground of the South" Today, it still retains a shared claim to the title among major cities along the Gulf Coast states. Galveston is a popular tourist destination which in 2007 brought $808 million to the local economy and attracted 5.4 million visitors. The city features an array of lodging options, including hotels such as the historic Hotel Galvez and Tremont House, vintage bed and breakfast inns, beachfront condominiums, and resort rentals like Sand `N Sea Properties. The city's tourist attractions include the Galveston Island Historic Pleasure Pier, Galveston Schlitterbahn waterpark, Moody Gardens botanical park, the Ocean Star Offshore Drilling Rig & Museum, the Lone Star Flight Museum, Galveston Railroad Museum, a downtown neighborhood of historic buildings known as The Strand, many historical museums and mansions, and miles of beach front from the East End's Porretto Beach, Stewart Beach to the West End pocket parks. Previously Galveston had a 40-acre (16 ha) aquarium theme park called Sea-Arama Marineworld, which opened in 1965, closed in January 1990, and was demolished in 2006. The Strand plays host to a yearly Mardi Gras festival, Galveston Island Jazz & Blues Festival and a Victorian-themed Christmas festival called Dickens on the Strand (honoring the works of novelist Charles Dickens, especially A Christmas Carol) in early December. Galveston is home to several historic ships: the tall ship Elissa (the official Tall Ship of Texas) at the Texas Seaport Museum and USS Cavalla and USS Stewart, both berthed at Seawolf Park on nearby Pelican Island. Galveston is ranked the number one cruise port on the Gulf Coast and fourth in the United States. Incorporated in 1986, Galveston Arts Center (GAC) is a non-profit, non-collecting arts organization. The center exhibits contemporary art, often by Texas-based artists, and offers educational and outreach programs. Notably, GAC organizes and produces Galveston ArtWalk. Museum entry is free to the public, although cash donations are welcomed. Tiered membership options and a range of volunteer opportunities are also available. In October 2015, Galveston Arts Center will celebrate relocation to its original home, the historic 1878 First National Bank Building on the Strand. This Italianate-style 1900 Storm survivor was extensively damaged during Hurricane Ike in 2008. Fortunately, just weeks before Ike made landfall, scaffolding was installed to support the entire structural load of the building for repairs, likely preventing collapse under heavy winds and storm surge. After a lengthy fundraising campaign, restoration is nearing completion. ArtWalk takes place approximately every six weeks on Saturday evenings throughout the year. ArtWalk is organized by Galveston Arts Center, which releases an ArtWalk brochure featuring a map of participating venues as well as descriptions of shows and exhibits. Venues include GAC, Galveston Artist Residency and artist's studios and galleries. Additionally, art is shown in “other walls”—for example MOD Coffeehouse or Mosquito Cafe—or outdoors at Art Market on Market Street. Musicians perform outdoors and at venues such as the Proletariat Gallery & Public House or Old Quarter Acoustic Cafe. While most ArtWalk events are concentrated downtown, there are a number or participants elsewhere on the island. Galveston is home to the Galveston Symphony Orchestra, an ensemble of amateur and professional musicians formed in 1979 under the direction of Richard W. Pickar, Musical Director-Conductor. The Galveston Ballet is a regional pre-professional ballet company and academy serving Galveston county. The company presents one full-length classical ballet in the spring of each year and one mixed repertory program in the fall, both presented at the Grand 1894 Opera House. Galveston Artist Residency (GAR) grants studio space, living space and a stipend to three visual artists each year. Resident artists work in a variety of mediums and exhibit their work in the GAR Gallery and Courtyards. Located in renovated industrial structures on the west side of downtown, GAR also hosts performances and other public events. The National Hotel Artist Lofts (NHAL) is an Artspace-developed property featuring twenty-seven live/work units designated as affordable housing for artists. The project brought new life to the historic E.S. Levy Building, which was left abandoned for twenty years. Originally built as the Tremont Opera House in 1870, the structure was extensively renovated to serve various functions, from offices and stores to the National Hotel. The building also housed the U.S. National Weather Bureau's Galveston office under Isaac Cline during the 1900 Storm. Under Property Manager/Creative Director Becky Major, the unused retail space in the front of the building found a new purpose as a DIY art and music venue, despite its gutted and undeveloped state. In May 2015, the newly renovated space reopened as the Proletariat Gallery & Public House. This bar and gallery provides a common area for NHAL and neighborhood residents and a cultural hub for the broader community. Visual art, events and live music are regularly hosted in the space. Galveston contains a large and historically significant collection of 19th-century buildings in the United States. Galveston's architectural preservation and revitalization efforts over several decades have earned national recognition. Located in the Strand District, the Grand 1894 Opera House is a restored historic Romanesque Revival style Opera House that is currently operated as a not-for-profit performing arts theater. The Bishop's Palace, also known as Gresham's Castle, is an ornate Victorian house located on Broadway and 14th Street in the East End Historic District of Galveston, Texas. The American Institute of Architects listed Bishop's Palace as one of the 100 most significant buildings in the United States, and the Library of Congress has classified it as one of the fourteen most representative Victorian structures in the nation. St. Joseph's Church was built by German immigrants in 1859–60 and is the oldest wooden church building in Galveston and the oldest German Catholic Church in Texas. The church was dedicated in April 1860, to St. Joseph, the patron saint of laborers. The building is a wooden gothic revival structure, rectangular with a square bell tower with trefoil window. The U.S. Custom House began construction in 1860 and was completed in 1861. The Confederate Army occupied the building during the American Civil War, In 1865, the Custom House was the site of the ceremony officially ending the Civil War. Galveston's modern architecture include the American National Insurance Company Tower (One Moody Plaza), San Luis Resort South and North Towers, The Breakers Condominiums, The Galvestonian Resort and Condos, One Shearn Moody Plaza, US National Bank Building, the Rainforest Pyramid at Moody Gardens, John Sealy Hospital Towers at UTMB and Medical Arts Building (also known as Two Moody Plaza). Dignified Resignation by Louis Amateis at the Galveston County Courthouse. With his back turned to the US flag while carrying a Confederate flag, it is the only memorial in Texas to feature a Confederate sailor. After the hurricane of 1900, the city originated the City Commission form of city government (which became known as the "Galveston Plan"). The city has since adopted the council-manager form of government. Galveston's city council serves as the city's legislative branch, while the city manager works as the chief executive officer, and the municipal court system serves as the city's judicial branch. The city council and mayor promote ordinances to establish municipal policies. The Galveston City Council consists of six elected positions, each derived from a specified electoral district. Each city council member is elected to a two-year term, while the mayor is elected to a two-year term. The city council appoints the city manager, the city secretary, the city auditor, the city attorney, and the municipal judge. The city's Tax Collector is determined by the city council and is outsourced to Galveston County. The city manager hires employees, promotes development, presents and administers the budget, and implements city council policies. Joe Jaworski is mayor, having replaced term-limited Lyda Ann Thomas May 2010. Jaworski is also the grandson of Leon Jaworski, United States Special Prosecutor during the Watergate Scandal in the 1970s. 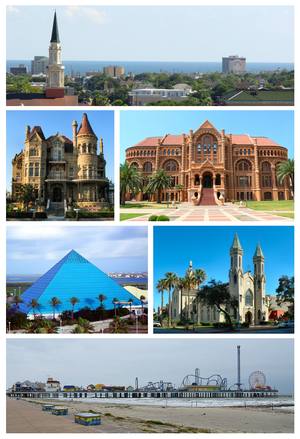 Galveston is the seat and second-largest city (after League City, Texas) of Galveston County in population. The Galveston County Justice Center, which houses all the county's judicial functions as well as jail, is located on 59th street. The Galveston County Administrative Courthouse, the seat of civil and administrative functions, is located near the city's downtown. Galveston is within the County Precinct 1; as of 2008[update] Patrick Doyle serves as the Commissioner of Precinct 1. The Galveston County Sheriff's Office operates its law enforcement headquarters and jail from the Justice Center. The Galveston County Department of Parks and Senior Services operates the Galveston Community Center. Galveston is located in District 23 of the Texas House of Representatives. As of 2008[update], Craig Eiland represents the district. Most of Galveston is within District 17 of the Texas Senate; as of 2008[update] Joan Huffman represents the district. A portion of Galveston is within District 11 of the Texas Senate; as of 2008[update] Mike Jackson represents the district. Galveston is in Texas's 14th congressional district and is represented by Republican Randy Weber as of 2012[update]. Established in 1891 with one building and fewer than 50 students, today the University of Texas Medical Branch (UTMB) campus has grown to more than 70 buildings and an enrollment of more than 2,500 students. The 84-acre (340,000 m2) campus includes schools of medicine, nursing, allied health professions, and a graduate school of biomedical sciences, as well as three institutes for advanced studies & medical humanities, a major medical library, seven hospitals, a network of clinics that provide a full range of primary and specialized medical care, and numerous research facilities. Galveston is home to two post-secondary institutions offering traditional degrees in higher education. Galveston College, a junior college that opened in 1967, and Texas A&M University at Galveston, an ocean-oriented branch campus of Texas A&M University. The city of Galveston is served by Galveston Independent School District, which includes six elementary schools, two middle schools and one high school, Ball High School. There is also one magnet middle school, Austin Middle School, serving grades 5 through 8. Galveston has several state-funded charter schools not affiliated with local school districts, including kindergarten through 8th grade Ambassadors Preparatory Academy and pre-kindergarten through 8th Grade Odyssey Academy. In addition KIPP: the Knowledge Is Power Program opened KIPP Coastal Village in Galveston under the auspices of GISD. Several private schools exist in Galveston. The Roman Catholic Archdiocese of Galveston-Houston operates two Roman Catholic private schools, including Holy Family Catholic School (K through 8th) and O'Connell College Preparatory School (9-12). Other private schools include Satori Elementary School, Trinity Episcopal School, Seaside Christian Academy, and Heritage Christian Academy. The Galveston County Daily News, founded in 1842, is the city's primary newspaper and the oldest continuously printed newspaper in Texas. It currently serves as the newspaper of record for the city and the Texas City Post serves as the newspaper of record for the County. Radio station KGBC, on air from 1947–2010, has previously served as a local media outlet. Television station KHOU signed on the air as KGUL-TV on March 23, 1953. Originally licensed in Galveston, KGUL was the second television station to launch in the Houston area after KPRC-TV. One of the original investors in the station was actor James Stewart, along with a small group of other Galveston investors. In June 1959, KGUL changed its call sign to KHOU and moved their main office to Houston. The local hip hop name for Galveston is "G-town." Galveston is the home of several of the largest teaching hospitals in the state, located on the campus of the University of Texas Medical Branch at Galveston. Prior to Hurricane Ike, the University employed more than 12,000 people. Its significant growth in the 1970s and 1980s was attributable to a uniquely qualified management and medical faculty including: Mr. John Thompson; Dr. William James McGanity, Dr. William Levin, Dr. David Daeschner and many more. Ike severely damaged the 550-bed John Sealy Hospital causing the University of Texas System Board of Regents to cut nearly one-third of the hospital staff. Since the storm, the regents have committed to spending $713 million to restore the campus, construct new medical towers, and return John Sealy Hospital to its 550-bed pre-storm capacity. In 2011, the UT Board of Regents approved the construction of a new 13 story hospital that will be located next to John Sealy Hospital. Construction will begin in the fall of 2011, with the demolition of the old Jennie Sealy and Shriners hospitals, and continue until completion in 2016. The facility will have 250 room, 20 operating suites and 54 intensive care beds. When the new hospital is complete, along with the renovations at John Sealy, both complexes will have around 600 beds. The university reopened their Level I Trauma Center on August 1, 2009 which had been closed for eleven months after the hurricane and, as of September 2009[update], had reopened 370 hospital beds. The city is also home to a 30-bed acute burns hospital for children, the Shriners Burns Hospital at Galveston. The Galveston hospital is one of only four in the chain of 22 non-profit Shriners hospitals, that provides acute burns care. Although the Galveston Hospital was damaged by Hurricane Ike, the Shriners national convention held in July 2009 voted to repair and reopen the hospital. The Galveston Fire Department provides fire protection services through six fire stations and 17 pieces of apparatus. The Galveston Police Department has provided the city's police protection for more than 165 years. Over 170 authorized officers serve in three divisions. The city is served by the Rosenberg Library, successor to the Galveston Mercantile Library, which was founded in 1871. It is the oldest public library in the State of Texas. The library also serves as headquarters of the Galveston County Library System, and its librarian also functions as the Galveston County Librarian. 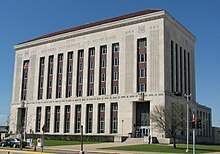 The Galveston Division of the United States District Court for the Southern District of Texas, the first federal court in Texas, is based in Galveston and has jurisdiction over the counties of Galveston, Brazoria, Chambers and Matagorda. It is housed in the United States Post Office, Customs House and Court House federal building in downtown Galveston. The United States Postal Service operates several post offices in Galveston, including the Galveston Main Post Office and the Bob Lyons Post Office Station. In addition the post office has a contract postal unit at the Medical Branch Unit on the campus of the University of Texas Medical Branch and the West Galveston Contract Postal Unit, located on the west end of Galveston Island in the beachside community of Jamaica Beach. Scholes International Airport at Galveston (IATA: GLS, ICAO: KGLS) is a two-runway airport in Galveston; the airport is primarily used for general aviation, offshore energy transportation, and some limited military operations. The nearest commercial airline service for the city is operated out of Houston through William P. Hobby Airport and George Bush Intercontinental Airport. The University of Texas Medical Branch has two heliports, one for Ewing Hall and one for its emergency room. The Galveston Railway, originally established and named in 1854 as the Galveston Wharf and Cotton Press Company, is a Class III terminal switching railroad that primarily serves the transportation of cargo to and from the Port of Galveston. The railway operates 32 miles (51 km) of yard track at Galveston, over a 50-acre (200,000 m2) facility. The Galveston Railroad today owned Rail Link Inc. interchanges with the Union Pacific Railroad Company and BNSF Railway Company on Galveston Island. The two class one Railroads reach Galveston by way of a new vertical lift railroad causeway bridge that crosses Galveston Bay next to the Interstate-45 bridge. John D. Groesbeck surveyed and mapped the town in 1837 and 1838 on behalf of the Galveston City Company. A new Galveston resident most recently from New York City, he laid out the streets based on a gridiron, and named the east–west avenues according to letters of the alphabet, with Avenue A running along the back bay on the north side of the island. He assigned numbers to names of north–south streets, with First Street on the far eastern side of the grid, and the numbered street names increased as they progressed westward. The names of some of the avenues changed over the years. Most notably, Avenue B became known as The Strand, and Avenue J became known as Broadway, a major thoroughfare which runs from the Interstate-45 viaduct to Seawall Boulevard. Interstate 45 has a southern terminus in Galveston and serves as a main artery to Galveston from mainland Galveston County and Houston. Farm to Market Road 3005 (locally called Seawall Boulevard) connects Galveston to Brazoria County via the San Luis Pass-Vacek Toll Bridge. State Highway 87, known locally as Broadway Street, connects the island to the Bolivar Peninsula via the Bolivar Ferry. A project to construct the proposed Bolivar Bridge to link Galveston to Bolivar Peninsula was cancelled in 2007. Island Transit, which operates the Galveston Island Trolley manages the city's public transportation services. Intercity bus service to Galveston was previously operated by Kerrville Bus Company; following the company's acquisition by Coach USA, service was operated by Megabus. Galveston is served by Amtrak's Texas Eagle via connecting bus service at Longview, Texas. World heavyweight boxer Jack Johnson, nicknamed the "Galveston Giant"
Galveston has been home to many important figures in Texas and U.S. history. During the island's earliest history it became the domain of Jean Lafitte, the famed pirate and American hero of the War of 1812. Richard Bache, Jr. who represented Galveston in the Senate of the Second Texas Legislature in 1847 and assisted in drawing up the Constitution of 1845. He was also the grandson of Benjamin Franklin, one of the Founding Fathers of the United States of America and Deborah Read. In 1886, the African-American Galveston civil rights leader Norris Wright Cuney rose to become the head of the Texas Republican Party and one of the most important Southern black leaders of the century. Noted portrait and landscape artist Verner Moore White moved from Galveston the day before the 1900 hurricane. While he survived, his studio and much of his portfolio were destroyed. A survivor of the hurricane was the Hollywood director King Vidor, who made his directing debut in 1913 with the film Hurricane in Galveston. Later Jack Johnson, nicknamed the “Galveston Giant”, became the first black world heavyweight boxing champion. During the first half of the 20th century, William L. Moody Jr. established a business empire, which includes American National Insurance Company, a major national insurer, and founded the Moody Foundation, one of the largest charitable organizations in the United States. Sam Maceo, a nationally known organized crime boss, with the help of his family, was largely responsible for making Galveston a major U.S. tourist destination from the 1920s to the 1940s. John H. Murphy, a Texas newspaperman for seventy-four years, was the longtime executive vice president of the Texas Daily Newspaper Association. Douglas Corrigan became one of the early transatlantic aviators, and was given the nickname "Wrong Way" for claiming to have mistakenly made the ocean crossing after being refused permission to make the flight. Grammy-award-winning singer-songwriter Barry White was born on the island and later moved to Los Angeles. George P. Mitchell, pioneer of hydraulic fracturing technology and developer of The Woodlands, Texas, was born and raised in Galveston. Anita Martini, pioneering female sports journalist who was the first woman allowed in a major league locker room for a post-game press conference, was born in Galveston. More recently Tilman J. Fertitta, part of the Maceo bloodline, established the Landry's Restaurants corporation, which owns numerous restaurants and entertainment venues in Texas and Nevada. Kay Bailey Hutchison was the senior senator from Texas and the first female Texas senator. Gilbert Pena, incoming 2015 Republican member of the Texas House of Representatives from Pasadena, was born in Galveston in 1949 and lived there in early childhood. Jonathan Pollard, who spied for Israel and was convicted in the US and sentenced to life in jail, was born in Galveston. The film and television actor Lee Patterson, a native of Vancouver, British Columbia, lived in Galveston and died there in 2007. Other notable people include Buffalo Bills Matt Carpenter, second baseman for the St. Louis Cardinals, Mike Evans, wide receiver for the Tampa Bay Buccaneers, 1998 Heisman Trophy runner-up and pro quarterback Michael Bishop, comedian Bill Engvall, actress Katherine Helmond and Tina Knowles, fashion designer and creator of House of Deréon, mother of Beyoncé and Solange Knowles. Pittsburgh Steelers great Casey Hampton. Grammy award-winning R&B and Jazz legend Esther Phillips was born in Galveston in 1935. "Galveston" is the name of a popular song written by Jimmy Webb and sung by Glen Campbell. Sheldon Cooper, one of the main characters from the CBS sitcom The Big Bang Theory, grew up in Galveston. The theater film, The Man from Galveston (1963), was the original pilot episode of the proposed NBC western television series Temple Houston, with Jeffrey Hunter cast as Temple Lea Houston, a lawyer and the youngest son of the legendary Sam Houston. For a time the real Temple Houston was the county attorney of Brazoria County, Texas. The Temple Houston series lasted for only twenty-six episodes in the 1963-1964 television season. Donald Barthelme's 1974 short story "I bought a little city" is about an unnamed man who invests his fortune in buying Galveston, only to sell it thereafter. Galveston is the setting of Sean Stewart's 2000 fantasy novel Galveston, in which a Flood of Magic takes over the island city, resulting in strange and carnivalesque adventures. It tied in 2001 with Declare, by Tim Powers, for the World Fantasy Award for Best Novel. It also won the 2001 Sunburst Award and was a preliminary nominee for the Nebula Award for Best Novel. The Drowning House, a novel by Elizabeth Black (2013), is an exploration of the island of Galveston, Texas, and the intertwined histories of two families who reside there. Stephenie Meyer has mentioned Galveston island in her third book of the Twilight series, Eclipse. Galveston (2010) is the first novel by Nic Pizzolatto, the creator of the HBO series True Detective. The Jinx (2015), an HBO miniseries, features Galveston as home to one of Robert Durst's murders which took place in 2001. ^ "History of the Oleander in America... By Way of Galveston". International Oleander Society. Archived from the original on April 1, 2010. Retrieved October 9, 2009. ^ "Table 1: Population Estimates for the 25 Largest U.S. Cities based on July 1, 2006 Population Estimates: April 1, 2000 to July 1, 2006" (PDF). Archived from the original (PDF) on April 5, 2008. ^ Donald E. Chipman (January 18, 2008). "The Handbook of Texas Online, Texas State Historical Association". www.tshaonline.org. pp. article "MALHADO ISLAND". Retrieved September 30, 2008. ^ a b David G. McComb. Table of Contents and Excerpt, McComb, Galveston. Galveston, A History - University of Texas Press. ISBN 978-0-292-72053-4. Retrieved October 3, 2009. ^ a b Harris Gaylord Warren. "Aury, Louis Michel". Handbook of Texas Online, Texas State Historical Association. Retrieved October 3, 2009. ^ a b c Harris Gaylord Warren. "Lafitte, Jean". Handbook of Texas Online, Texas State Historical Association. Retrieved October 3, 2009. ^ Jimmie Walker. "The Legend of Jean Lafitte". Kemah Historical Society. Retrieved October 3, 2009. ^ a b "Port of Galveston". World Port Source. Retrieved October 3, 2009. ^ "Menard, Michel Branamour". Handbook of Texas Online, Texas State Historical Association. Retrieved October 4, 2009. ^ "The Galveston Collection". Texas Archival Resources Online, University of Houston. Archived from the original on May 1, 2008. Retrieved October 4, 2009. ^ a b c d "History of Galveston". Isaac's Storm, Random House. Retrieved October 3, 2009. ^ "Galveston Island". Handbook of Texas Online, Texas State Historical Association. Retrieved October 3, 2009. ^ a b Barrington, Carol; Kearney, Sydney (2006). Day Trips from Houston: Getaway Ideas for the Local Traveler. Globe Pequot. p. 241. ISBN 0-7627-3867-7. ^ Alwyn Barr. "Galveston, Battle of". Handbook of Texas Online, Texas State Historical Association. Retrieved October 3, 2009. ^ Hales, Douglas (2003). A Southern Family in White & Black: The Cuneys of Texas. Texas A&M University Press. pp. 18–19. ISBN 1-58544-200-3. ^ "History: Galveston's Colorful Past". Galveston Chamber of Commerce. Archived from the original on June 8, 2011. Retrieved October 3, 2009. ^ "The History of Galveston". Wyndham Hotels. Retrieved October 3, 2009. ^ Pitre, Merline. Cuney, Norris Wright. Handbook of Texas. Texas State Historical Association. Retrieved October 15, 2009. ^ Obadele-Starks, Ernest (2001). Black Unionism in the Industrial South. Texas A&M University Press. pp. 39–44. ISBN 0-89096-912-4. ^ Hales, Douglas (2003). A Southern Family in White & Black: The Cuneys of Texas. Texas A&M University Press. pp. 15–16. ISBN 1-58544-200-3. ^ Edward Coyle Sealy. "Galveston Wharves". Handbook of Texas Online, Texas State Historical Association. Retrieved September 13, 2009. ^ "GULF COAST REGION: GALVESTON TEXAS". durangotexas.com. Retrieved September 25, 2015. ^ a b c John Edward Weems. "Galveston Hurricane of 1900". Handbook of Texas Online, Texas State Historical Association. Retrieved October 4, 2009. ^ "Handbook of Texas Online, s.v. "Commission Form of City Government,"". Retrieved October 15, 2009. ^ "Galveston Movement". Handbook of Texas Online, Texas State Historical Association. Retrieved October 3, 2009. ^ Gary Cartwright (1998). Galveston: A History of the Island. TCU Press. ISBN 0-689-11991-7. ^ "Annual Financials report, 2004-2005" (PDF). The Moody Foundation. Archived from the original (PDF) on May 29, 2009. Retrieved October 3, 2009. ^ "American National Announces Fourth Quarter 2007 Results" (PDF). American National Insurance Company. Archived from the original (PDF) on October 1, 2011. Retrieved October 3, 2009. ^ "Galveston Hotel - Hotel Galvez to Reopen October 15". Bloomberg.com. October 8, 2008. Archived from the original on October 25, 2012. Retrieved September 26, 2009. ^ "Preserve America Community: Galveston, Texas". Retrieved September 26, 2009. ^ a b David G. McComb. "Galveston, TX". Handbook of Texas Online, Texas State Historical Association. Retrieved September 26, 2009. ^ John Nova Lomax (March 3, 2009). "Is Casino Gambling in the Cards for Galveston?". Houston Press. Retrieved September 26, 2009. ^ "The Press: Gambling in Texas". Time Magazine. January 12, 1952. Retrieved September 26, 2009. ^ Melosi, Martin V.; Pratt, Joseph A. (2007). Energy Metropolis: An Environmental History of Houston and the Gulf Coast. University of Pittsburgh Press. ISBN 0-8229-4335-2. ^ Robert E. Baker. "Moody Foundation". Handbook of Texas Online, Texas State Historical Association. Retrieved October 3, 2009. ^ Utley Robert Marshall (2007). Lone Star Lawmen. Oxford. p. 218. ISBN 978-0-19-515444-3. ^ James G. Dickson, Jr. "Attorney General". Handbook of Texas Online, Texas State Historical Association. Retrieved September 26, 2009. "The Daily News: Headlines". The Galveston County Daily News. Archived from the original on February 8, 2010. Retrieved September 26, 2009. Sitton, Thad (2006). The Texas Sheriff: Lord of the County Line. University of Oklahoma Press. p. 146. ISBN 978-0-8061-3471-0. Communications, Emmis (December 1983). "Grande Dame of the Gulf". Texas Monthly: 169. ^ Paul Burka (December 1, 1983). "Grande Dame of the Gulf". Texas Monthly. Retrieved September 27, 2009. ^ Melosi, Martin V.; Pratt, Joseph A. (2007). Energy metropolis: an environmental history of Houston and the Gulf Coast. University of Pittsburgh Press. p. 202. ISBN 0-8229-4335-2. ^ "The History of Galveston College". Galveston College. Archived from the original on September 21, 2009. Retrieved October 4, 2009. Rhiannon Myers (November 14, 2007). "Students brave the simulated seas". The Galveston County Daily News. Archived from the original on September 28, 2011. Retrieved September 13, 2009. ^ Novak, Shonda Growth Wave Hits Galveston." Austin American-Statesman. Saturday July 22, 2006. ^ Harvey Rice (February 22, 2007). "Workers in Galveston increasingly can't afford to live there". Houston Chronicle. Retrieved October 4, 2009. ^ "Ike Insured Damage Estimates Range from $6B to $18B". Texas / South Central News, Insurance Journal. September 15, 2008. Retrieved October 3, 2009. ^ "Galveston Still Healing 5 Years After Hurricane Ike". The Texas Tribune. Retrieved September 25, 2015. ^ Jervis, Rick (March 25, 2014). "After rebuilding from Hurricane Ike, Galveston deals with oil spill". USA TODAY. Retrieved September 25, 2015. ^ "Rock Sediment and Soil Facts, Galveston Island". Geologic Wonders of Texas, University of Texas. Retrieved October 3, 2009. ^ "Geographic Identifiers: 2010 Demographic Profile Data (G001): Galveston city, Texas". American Factfinder. U.S. Census Bureau. Retrieved February 24, 2017. ^ Woodhams, Susie. "After Ike, a deluge of reinvention." Boston Globe. June 5, 2011. Retrieved on June 6, 2011. ^ D. Freeman. "Map 1. Galveston's Neighborhoods". Retrieved October 4, 2009. ^ Jones, Leigh. "Council to consider golf cart committee[permanent dead link]." Galveston County Daily News. November 9, 2009. Retrieved on June 11, 2012. ^ a b "Texas (TX), Galveston County". National Register of Historical Places. Retrieved October 3, 2009. ^ "Silk Stocking National Historic District". Archived from the original on December 30, 2010. Retrieved April 15, 2009. ^ "Oleanders...a must in Brenda's Garden!". guidrynews.com. May 1, 2011. Retrieved July 31, 2017. ^ "Galveston's Oleander Festival". WinterTexans Online. Retrieved July 20, 2017. ^ Richard & Mary Ellen Eggenberger (1996). Handbook on Oleanders. Retrieved July 20, 2017. ^ Shannon Rowan. "International Oleander Society". The Islander Magazine. Retrieved July 25, 2017. ^ "Oleander Festival". Texas Highways Magazine. July 13, 2012. Archived from the original on July 28, 2017. Retrieved July 20, 2017. ^ "International Oleander Society". International Oleander Society. Retrieved July 20, 2017. ^ "Oleander Garden Park". Atlasobscura.com. Retrieved July 25, 2017. ^ "USDA Plant Hardiness Zone Map". United States Department of Agriculture. Archived from the original on February 27, 2014. Retrieved April 17, 2018. ^ "Monthly Averages for League City, TX (77573)". The Weather Channel. Archived from the original on October 19, 2012. Retrieved October 4, 2009. ^ "National Climatic Data Center]". National Oceanic and Atmospheric Administration, United States Department of Commerce. June 23, 2004. Archived from the original on December 10, 2006. Retrieved December 14, 2006. ^ "Average Relative Humidity". Department of Meteorology at the University of Utah. Archived from the original on December 9, 2006. Retrieved December 14, 2006. ^ "Monthly Averages for League City, TX (77573)". The Weather Channel web site. Retrieved October 4, 2009. ^ "Monthly Averages for Pasadena, TX (77573)". The Weather Channel web site. Retrieved October 4, 2009. ^ a b c d "NowData - NOAA Online Weather Data". National Oceanic and Atmospheric Administration. Retrieved April 17, 2018. ^ Berger, Eric (September 9, 2008). "Would a category 3 hurricane surge flood your home?". Houston Chronicle. Retrieved October 15, 2009. ^ Spinner, Kate (May 31, 2009). "Hurricane forecasters zero in on threat of surge". Sarasota Herald Tribune. Retrieved October 15, 2009. Just north of Galveston Island, the Bolivar Peninsula shields Galveston Bay much like Lido Key and Longboat Key shield Sarasota Bay. ^ Mean monthly maxima and minima (i.e. the highest and lowest temperature readings during an entire month or year) calculated based on data at said thread from 1981 to 2010, i.e. the COOP station from January 1981 to December 1996, and Scholes Int'l from January 1997 to December 2010. ^ Official records for Galveston were kept at an unknown location from April 1871 to August 1946, at the COOP station from September 1946 to December 1996, and at Scholes Int'l since January 1997. The temperature record dates back to June 1874. Therefore, precipitation day normals are not currently available at Scholes Int'l. For more information, see ThreadEx. ^ "WMO Climate Normals for Galveston, TX 1961–1990". National Oceanic and Atmospheric Administration. Retrieved September 9, 2015. ^ "Monthly Averages for Galveston, TX". The Weather Channel. Retrieved February 8, 2012. ^ Samenow, Jason (June 26, 2012). "Record setting heat wave roasts Rockies (Denver), Plains, heading east". The Washington Post. ^ "Station Name: TX GALVESTON". National Oceanic & Atmospheric Administration. Retrieved July 7, 2016. ^ "US Census Press Releases". US Census Bureau. Archived from the original on June 17, 2007. Retrieved June 16, 2017. ^ "History of The Port of Galveston, Texas". The Post of Galveston. Archived from the original on October 21, 2009. Retrieved September 27, 2009. ^ "Carnival's newest ship to be based in Texas". USA TODAY. Retrieved November 25, 2017. ^ Tribou, Richard. "Carnival Magic coming to Port Canaveral sooner than expected". OrlandoSentinel.com. Retrieved November 25, 2017. ^ News, LAURA ELDER The Daily. "Carnival to shorten Liberty cruises, replace ship with Valor". The Daily News. Retrieved November 25, 2017. ^ "Carnival Vista Heads to Galveston, Carnival Breeze to Port Canaveral | Travel Agent Central". www.travelagentcentral.com. Retrieved November 25, 2017. ^ "Carnival bringing new cruise ships to New Orleans in 2019". NOLA.com. Retrieved November 25, 2017. ^ Nell Newton. "American National Insurance Company". Hoover's. Retrieved October 4, 2009. ^ "2008 Annual Report Archived August 6, 2010, at the Wayback Machine." American National Insurance Company. Retrieved October 4, 2009. ^ "About Moody National Bank Archived April 20, 2009, at the Wayback Machine." Moody National Bank. Retrieved October 4, 2009. ^ Laura Elder (September 22, 2009). "After year in Webster, United Fire returns to isle". The Galveston County Daily News. Archived from the original on February 24, 2012. Retrieved October 4, 2009. ^ "A Gulf Coast gem is becoming a 'Playground of the South' all". meetingsfocus.com. Retrieved September 25, 2015. ^ "Galveston Island - Tour Texas". tourtexas.com. Archived from the original on September 27, 2015. Retrieved September 25, 2015. ^ Hlavaty, Craig (July 10, 2018). "Sea-Arama in Galveston was an island attraction for decades". Houston Chronicle. Retrieved July 11, 2018. ^ "Historic City, New Opportunities". Galveston Chamber of Commerce. Archived from the original on July 11, 2011. Retrieved April 13, 2009. ^ "Galveston Art Center". galvestonartscenter.org. Retrieved September 25, 2015. ^ "Galveston Art Center". galvestonartscenter.org. Archived from the original on September 26, 2015. Retrieved September 25, 2015. ^ "About The Galveston Symphony Orchestra". The Galveston Symphony Orchestra. Retrieved April 13, 2009. ^ "Galveston Ballet Home". Archived from the original on April 25, 2009. Retrieved April 13, 2009. ^ "Galveston Artist Residency". galvestonartistresidency.org. Retrieved September 25, 2015. ^ "National Hotel Artist Lofts". Artspace. Retrieved September 25, 2015. ^ "ES LEvy Home pg". mgaia.com. Retrieved September 25, 2015. ^ "National Trust for Historic Preservation Announces 2009 List of America's 11 Most Dangered Historic Places". Reuters. April 28, 2009. Archived from the original on January 22, 2010. Retrieved October 1, 2009. ^ "Texas (TX), Galveston County". National Register of Historical Places. Retrieved October 1, 2009. ^ "Galveston Grand 1894 Opera House". City of Houston eGovernment Center. Retrieved October 3, 2009. ^ "Bishop's Palace--South and West Texas". A National Register of Historic Places Travel Itinerary, US National Park Service. Retrieved October 3, 2009. ^ Carmack, Liz. Historic Hotels of Texas Archived March 10, 2009, at the Wayback Machine, Texas A&M University Press: College Station, Texas, 2007. pp. 47–49. ^ "Ashton Villa--South and West Texas". A National Register of Historic Places Travel Itinerary, US National Park Service. Retrieved October 3, 2009. ^ Judy D. Schiebel. "ASHTON VILLA". Texas State Historical Society: Handbook of Texas. Retrieved May 15, 2010. ^ "Ashton Villa". National Park Service. Retrieved May 15, 2010. ^ "1859 St. Joseph's Church". Galveston Historical Foundation. Archived from the original on July 11, 2011. Retrieved October 3, 2009. ^ "More About the 1861 Custom House". Galveston Historical Foundation. Archived from the original on February 20, 2009. Retrieved October 3, 2009. ^ "Galveston During the Civil War". Institute of Nautical Archaeology at Texas A&M University. Archived from the original on September 12, 2009. Retrieved October 3, 2009. ^ Morris Little, Carol (1996). A Comprehensive Guide to Outdoor Sculpture in Texas. University of Texas Press. p. 229. ^ Meyers, Rhiannon. "Jaworski replaces a tearful Thomas as mayor". Galveston Daily News. Archived from the original on May 17, 2010. Retrieved May 17, 2010. ^ "Statistics, Galveston County". Bay Area Houston Economic Partnership. Archived from the original on June 17, 2008. Retrieved October 3, 2009. ^ "Galveston County Justice Center." Galveston County, Texas. Accessed November 7, 2008. ^ "Precinct 1 Archived January 8, 2013, at the Wayback Machine." Galveston County, Texas. Retrieved October 4, 2009. ^ "Welcome to the Galveston County Sheriff's Office Home Page." Galveston County Sheriff's Office. Retrieved October 4, 2009. ^ "Galveston County Sheriff's Office Corrections Bureau - Jail Division." Galveston County Sheriff's Office. Retrieved October 4, 2009. ^ Facilities Overview Archived August 31, 2005, at the Wayback Machine." Galveston County Department of Parks and Senior Services. Retrieved October 4, 2009. ^ "District 23 Archived December 19, 2008, at the Wayback Machine." Texas House of Representatives. Retrieved October 4, 2009. ^ "Senate District 17 Archived December 19, 2008, at the Wayback Machine" Map. Senate of Texas. Retrieved October 4, 2009. ^ "Senate District 11 Archived December 18, 2014, at the Wayback Machine" Map. Senate of Texas. Retrieved October 4, 2009. ^ Meghan Flynn (August 1, 2009). "University of Texas Medical Branch at Galveston: Stops for No Storm". Inside Healthcare. Archived from the original on July 13, 2011. Retrieved October 1, 2009. ^ "Defining the Future of Health Care" (PDF). UTMB Office of Public Affairs. Archived from the original (PDF) on December 18, 2014. Retrieved October 1, 2009. ^ "Texas A&M University, Galveston". Best Colleges - Education - US News and World Report. Archived from the original on August 27, 2009. Retrieved October 1, 2009. ^ Rhiannon Meyers (February 6, 2008). "GISD hopes magnet school attracts students". The Galveston County Daily News. Archived from the original on February 24, 2012. Retrieved October 1, 2009. ^ a b c "Galveston, Texas Private Schools". galveston.com. Retrieved October 4, 2009. ^ Radcliffe, Jennifer. "New KIPP campuses have younger focus." Houston Chronicle. March 30, 2009. Retrieved October 4, 2009. ^ "The Galveston County Daily News". Galvestondailynews.com. Archived from the original on October 8, 2008. Retrieved October 28, 2008. ^ Leigh Jones (March 10, 2009). "Island radio station making a comeback". The Galveston County Daily News. Archived from the original on February 9, 2010. Retrieved October 4, 2009. ^ a b "KHOU History". KHOU.com. Archived from the original on June 11, 2008. Retrieved October 4, 2009. ^ Lomax, John Nova. "On Da Lingo, Part II." Houston Press. Thursday November 17, 2005. Retrieved on October 26, 2011. ^ a b Harvey Rice (September 16, 2009). "UTMB coming back stronger from Ike". Houston Chronicle. Retrieved October 4, 2009. ^ John DeLapp (August 26, 2011). "UTMB gets OK to build new island hospital". The Daily News. Archived from the original on August 29, 2012. Retrieved September 18, 2011. ^ Scott Gonzales (August 2, 2009). "UTMB emergency room reopens after Ike". The Galveston County Daily News. ^ a b Laura Elder (July 7, 2009). "Shriners vote to keep isle burns hospital open". The Galveston County Daily News. Archived from the original on July 16, 2011. Retrieved October 4, 2009. ^ Elizabeth Allen (July 10, 2009). "Shriners will keep hospitals open Galveston facility to reopen in a few weeks". Houston Chronicle. Retrieved October 4, 2009. ^ "Hospitals Listed by Specialty". Shriners Hospitals for Children. Archived from the original on August 26, 2009. Retrieved October 5, 2009. ^ "Fire Department Archived July 5, 2006, at the Wayback Machine." City of Galveston. Retrieved October 4, 2009. ^ "Rosenber Library". Handbook of Texas, Texas State Historical Association. Retrieved May 17, 2010. ^ "Rosenberg Library". Rosenberg-library.org. Retrieved October 28, 2008. ^ "About the Rosenberg Library Archived June 6, 2011, at the Wayback Machine." Rosenberg Library. Retrieved October 4, 2009. ^ "Southern District of Texas, Galveston Division" (PDF). United States District and Bankruptcy Courts. Archived from the original (PDF) on May 20, 2009. Retrieved October 4, 2009. ^ "Southern District of Texas, History of the District". United States District and Bankruptcy Courts. Archived from the original on September 17, 2009. Retrieved October 4, 2009. ^ "Post Office Location - Bob Lyons Archived March 21, 2009, at the Wayback Machine." United States Postal Service. Retrieved October 4, 2009. ^ "Post Office Location - Galveston." United States Postal Service. Retrieved October 4, 2009. ^ David G. McComb (1986). Galveston: A History. Austin: University of Texas Press. p. 43. ISBN 978-0-292-72053-4. ^ Collette, Mark (July 8, 2007). "Bolivar bridge goes nowhere". The Daily News Galveston County. Retrieved June 12, 2013. ^ Merline Pitre. "Cuney, Norris Wright". The Handbook of Texas Online, Texas State Historical Association. Retrieved October 8, 2009. ^ "Vidor, King Wallis". The Handbook of Texas Online, Texas State Historical Association. Retrieved October 8, 2009. ^ "Johnson, Jack". The Handbook of Texas Online, Texas State Historical Association. Retrieved October 8, 2009. ^ Robert E. Baker. "Moody Foundation". The Handbook of Texas Online, Texas State Historical Association. Retrieved October 3, 2009. ^ "Aviation". The Handbook of Texas Online, Texas State Historical Association. Retrieved October 8, 2009. ^ "Tilman J. Fertitta". Forbes. Archived from the original on September 25, 2009. Retrieved October 8, 2009. ^ "Hutchison, Kathyrn Ann Bailey (Kay) – Biographical Information". Biographical Directory of the United States Congress. Retrieved October 8, 2009. ^ "Meet Gilbert Pena". Take Back House District 144. Archived from the original on December 20, 2014. Retrieved December 10, 2014. ^ R. C. S. Trahair (2004). Encyclopedia of Cold War Espionage, Spies, and Secret Operations. Greenwood Publishing Group. pp. 267–268. ISBN 978-0-313-31955-6. Retrieved April 10, 2012. ^ "MLB Player Stats (Matt Carpenter)". Retrieved August 23, 2013. ^ "Galveston's Sister Cities". City of Galveston. Retrieved February 21, 2015. Larson, Erik. Isaac's Storm, New York: Vintage Books, 2000.